Another Valentine's Day is amongst us and we always love to think outside of the box when showing our fondness for a loved one. Within the last year, I started noticing these incredible flower cupcake bouquets arising and I could not believe how realistic they looked. I searched to see if anyone was doing this with macarons and when I could not find it, I decided to create my own. Thank you to all the cupcake artists out there for inspiring me to create this. The first place to start is by making your macarons and buttercream. Divide your macaron batter into 1/3 and 2/3. To the 1/3 part, you are going to color it a dark forest green with a gel food color. To the 2/3 part, you are going to color it a combination of a drop of green gel food coloring and a drop of electric yellow gel food color. Place each part in it's own piping bag with a large round tip. Start by piping a dime-sized amount of the dark green, followed by the lighter green inside of that circle until it reaches the preferred size (macarons should measure out to 1 to 2 inches in circumference). You will need about 30 to 35 macarons (that includes top and bottom) for this recipe. 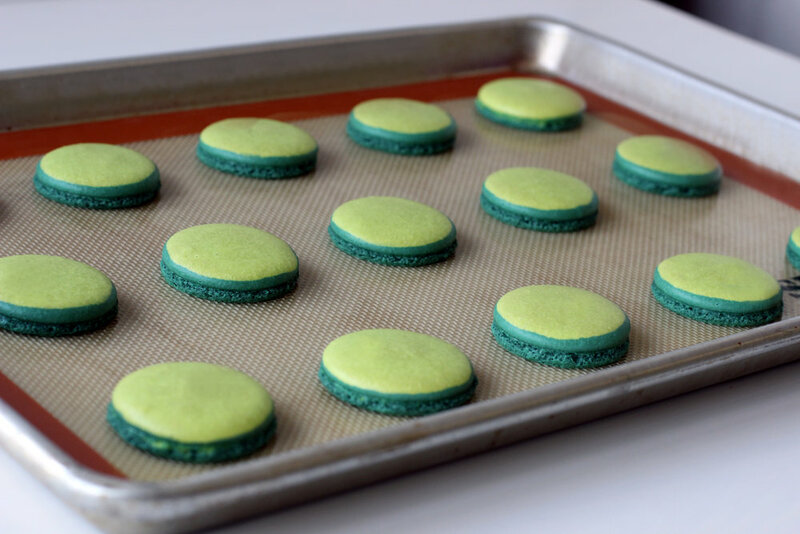 Tap sheet pans against a surface, allow macarons to set, bake, and cool. While the macarons are setting, create three types of buttercream frosting. The first should be a light green color for the filling for the macarons (1 stick of unsalted butter to a cup of icing sugar), the second frosting should be a rose pink colored for the roses (about 3 sticks of unsalted butter and 3 cups of icing sugar), and the third buttercream frosting should be a dark forest green (2 sticks of unsalted butter and 2 cups of icing sugar). Allow to sit at room temperature without becoming too warm. When macarons have cooled completely, fill with light green buttercream and place in refrigerator to set. Step 2: Garnish macarons with buttercream roses. I used the #104 petal tip to pipe the roses onto the top of the macarons with the narrower end up. Create a bud in the center of the macaron and pipe small petals around it. Once you have piped all of your macarons, place in the refrigerator to set completely. For the inside of the bowl, I purchased an 8-inch styrofoam ball, which I found at a craft store. You also want to get small toothpicks. Take rose macarons out of the refrigerator and allow shells to come to room temperature slightly. Use a small offset spatula to begin placing your dark green buttercream on styrofoam, but leaving the top uncovered, so you have place to put your hand to keep the ball steady while placing the first two rows of flower onto the ball. The bottom row of macarons should have some of the dark green buttercream on the bottom of the shells before placing on the ball, because they somewhat defy gravity. Use one toothpick per macaron to place 1/3 of the end of the toothpick into the center of each macaron before attaching it to the buttercream on the ball. Continue to do this with the first row all the way around the ball. The second row will need toothpicks, but not buttercream on the bottoms of the shells (the buttercream on the ball will be sufficient enough). Note: If the flowers get too warm, place back in the refrigerator for a few minutes before proceeding. Continue to place all rows of flowers onto the buttercream ball with toothpicks. Once all of the needed roses are on your ball, remove any residual buttercream on the bowl, and place in the refrigerator to set completely. This is such an extraordinary project that looks realistic and is absolutely worth the time!